Putumayo has been a favorite record label of WSUM’s world music genre leaders (fancy name for DJ wranglers) for some years now, if for no other reason than because their releases serve as primers for any DJ slightly nervous about taking a head-first leap into the music of other cultures. Now Putumayo has a new collection that is sure to appeal to many and may even introduce other cultures to a great era in American music history: Jazz. This CD is a compilation of artists spanning from the classics– like Nat King Cole– to those who fall short of the “household name” moniker– like Blossom Dearie. Luckily, this CD comes with a detailed booklet that’ll help you get acquainted with all the artists. Although the album is technically true to its title, I did expect it to sound more… jazzy, with a greater variety of tempos and instrumentation. Instead, the general feel is slow-paced and cool. Don’t hope for it to stray from the typical sax/bass/piano/drums ensemble, and there’s certainly no swing or big band here. Instead, give this album a spin if you’re looking to relax or need a torchy backdrop to your happy hour. “Waltz For Debby,” by Cannonball Adderley with Billy Evans, is a track to pay particular attention to. Opening with Evans on solo piano for the first minute, and continuing onward as a pure jazz instrumental, it’s the only track that truly lived up to my pre-conceived idea of what this album would sound like. That’s not to say the rest of the album is disappointing. In fact, everything flows together and I’m sure it has something for everybody. Nat King Cole fans: Rejoice– he’s right at the top of the playlist at Track 2. Want some aural velvet? Chet Baker brings it to you on Track 6. And Billie Holiday fans can expect the grand finale at Track 12. If I had one critique about the album (and, well, I do), it’s this: The recordings selected to feature Maxine Sullivan, Anita O’Day, and Billie Holiday all catch them well past their prime. Sullivan is noticeably older in this recording of “‘Taint No Use” as compared to when she recorded the song that made her famous, “Ol’ Rockin’ Chair,” for example. Anita O’ Day and Billie Holiday both have voices so gravely it took quite a bit of might not to skip to the next track. Meanwhile, take solace in the fact that Nina Simone is great as ever in the lead track. Blossom Dearie — whoever she may be — sounds a heckuva lot like Earth Kitt. And if I were “Debby,” I’d be pretty impressed that Billy Evans played that waltz for me. 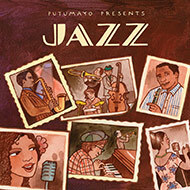 To learn more about the album — and to preview the tracks — visit its official Putumayo website.